If your dog is of the water loving kind and you are camping somewhere with a lake or streams, you can expect to get wet. At least expect your dog to get wet. Oh, yeah – and fishing- well, fishing might be somewhat of a difficult task if pooch decides to take a dip instead or to bark at the fish. You might instead plan on enjoying a fun family swim, dog included. When camping, there are always other animals around, be it canine companions to other campers or wild animals in the surrounding woods. So, be prepared for how your dog might react to these animals. It’s one thing when your dog runs off to find a lady friend, but quite another when he runs off to chase a rabbit. It is important to ensure that your dog’s vaccinations are all up to date before leaving on vacation with your dog. You never know what kind of animal he might encounter while out in the woods. Even in areas with little to no wild animals can be of danger to your pet. Other animals carry all manner of diseases that can harm your pet if exposed to them. Yes, we know you will not forget your own needed clothes and hygiene supplies, nor will you forget your other handy little supplies for recreation. So, don’t forget your pet’s either. Keep in mind that your dog will need food, water, and the bowls to put it in. He may also need his bed to sleep in if he has a special bed. Leashes and harnesses may be needed for certain areas, such as rest stops en route. Make a list of things you might need for your pet when you make your own packing list. Heaven forbid your best friend on four legs gets lost, but it could happen. So, be prepared for the worst and make sure your dog has his collar on with the properly attached tags indicating where he lives. Include his name along with your address and/or phone number. Here is a simple gas saving tip from Bruton Motor Sports. Maintaining proper tire pressure will allow your vehicle to move down the road with no drag. Low tire pressure in one or two tires creates drag. Thus making your vehicles engine work hard to propel the vehicle forward. Higher RPM's less fuel mileage. Low tire pressure will also wear out your tires much faster and cost you even more money down the road. Check your tire pressure at each fill up and save money now! 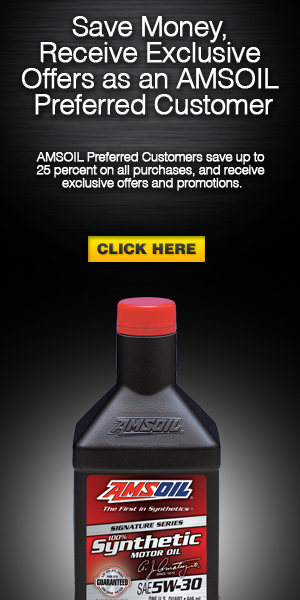 Whether you ride to take the checkered flag or conquer the trails near home, AMSOIL has you covered. Most dirt bike riders have one goal in mind when they hit the track or trail: ride faster and more effectively. Clutch performance goes a long toward ensuring you get out front and stay out front. Clutch slippage or inconsistent clutch feel can lead to poor starts out of the gate, while maneuvering around obstacles on the trail increases the opportunity for clutch slippage if low-quality lubricants are used. AMSOIL Synthetic Dirt Bike Oil’s superior friction-durability properties help minimize clutch slippage, fade and chatter, giving riders consistent clutch feel during takeoffs or when navigating the trail. In an extreme simulated-start test, AMSOIL Synthetic Dirt Bike Oil continued to deliver consistent clutch feel following 32 simulated race starts, while a leading manufacturer’s oil demonstrated inconsistent clutch-lever action and poor clutch feel after 16 starts. AMSOIL Synthetic Dirt Bike Oil’s superior performance helps instill in riders the confidence that their bikes will perform consistently in all types of riding conditions. It also delivers superior wear protection for engine and clutch components. Some riders, however, prefer a dedicated transmission fluid instead of a multi-purpose motor oil. For them, AMSOIL Synthetic Dirt Bike Transmission Fluid Features a wet-clutch-compatible formulation designed to prevent clutch slippage and deliver consistent, confident clutch feel. It helps you ride smoother and faster for maximum performance. It also provides excellent wear protection for gears and clutch plates, reducing time and money spent on maintenance. Although easy to overlook, the chain is another important area to maintain. In order to ensure optimum performance and life, dirt bike chains require premium lubrication and protection against dirt, mud, water and constant stress. AMSOIL Chain Lube doesn’t fling off, helping you avoid the hassles of frequent reapplication and the stresses of worrying about chain durability. Degraded fuel presents major problems for dirt bike engines. It can form varnish, gum and insoluble debris that clog carburetors, fuel injectors and fuel filters. Carbon buildup can form on the tops of pistons, causing pre-ignition, rough idling and poor throttle response. AMSOIL Quickshot® is formulated to thoroughly clean and restore peak performance in dirt-bike fuel systems. Its revolutionary technology addresses problems associated with ethanol, water and dirty pump gas.